WW Gallery is pleased to present Broughton and Birnie's The Forger's Tale: The Quest for Fame and Fortune, an immersive installation and exhibition chronicling the tragic events that led to the demise of twentieth century forger Georg Bruni. Focusing upon the events surrounding the sale of a forged Picasso painting to a Nazi collector, the show takes a detail from the original Forger's Tale exhibition, about the life and times of Georg Bruni held at the Crypt Gallery in May 2012. Weaving fact and fiction in a richly detailed forgery of their own, Broughton and Birnie play with plausibility and authority in a post-internet world of self-constructed realities and identities. The Quest for Fame and Fortune presents an experiential narrative, in which the viewer is led through Bruni's story room by room. From the documentary cinema kiosk, to the Collectors and Regenerate Rooms surveying German art from the Berlin Dada exhibition and the Degenerate Art Show, and finally to the wild and grotesque performance of the Cabaret; the spirit and atmosphere of Bruni's Berlin is evoked. Akin to the information overload encountered on the vast data resource of the web, the experience of Bruni's world overwhelms us. Pandering to an information hungry and status-obsessed society, Broughton and Birnie offer a sprawling maze of information within which the viewer is able to pick up and follow individual threads. But as counterfeiters they have also left a deliberate trail of deceit. Visual clues including familiar faces from reality television and politics, a-historical props and incongruous paraphernalia: all allow the audience to peel back layers of forged historicity. 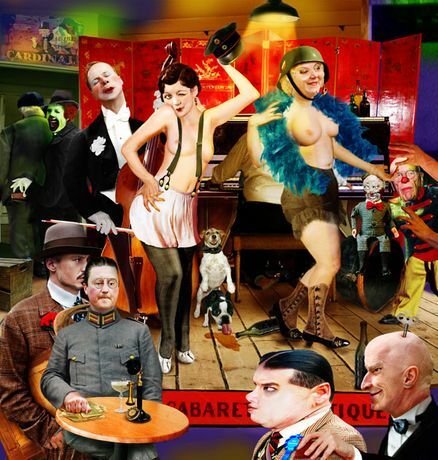 Within Broughton and Birnie's retelling of Germany's social and political upheavals, the astoundingly creative artistic culture, and the legendary nightlife of the short-lived Weimar Republic, we find parallels with contemporary life that make for an unnerving satire. Combining archive material and old photographs with the manipulative processes of new technology Broughton and Birnie capture the spirit of a past era whilst performing a wicked parody of current pop culture and politics: forcing the two worlds to collide in a flagrant deception.